Watch a video of the Shedd Aquarium otters playing with the maze. Take a piece of Plexiglas, some shrimp, and a plastic ball, and what do you get? The perfect puzzle for a sea otter — and the latest project to come out of a unique partnership between Northwestern’s McCormick School of Engineering and Chicago’s Shedd Aquarium. Sea otters are highly energetic and love to play, so goal-driven playtime is important to keep them mentally stimulated and active. Students in the Interdisciplinary Design Projects course in Northwestern’s Segal Design Institute were called on to create an enrichment experience that would do just that. Each year, McCormick students are challenged to design a solution to meet the needs of the Shedd’s Fishes, Marine Mammals, and Animal Health departments. 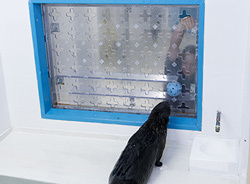 The winning concept was a maze-like puzzle — a 44 x 32 x 6-inch block of thick Plexiglas — that fits into the window opening between the otters’ pool and the trainers’ area. When a trainer tosses in a special hollow ball stuffed with shrimp, the otter learns to slide the ball down the various levels to an opening at the bottom. The students — Matthew Crocker (mechanical engineering ’14), Chloe Frizelle (mechanical engineering ’15), Samantha Hatfield (mechanical engineering ’14), and Sofia Maspons (radio, television, and film ’14) — worked on the project for two quarters with John Lake, lecturer in the Segal Design Institute, and John Anderson, lecturer in the Writing Program at Northwestern’s Judd A. and Marjorie Weinberg College of Arts and Science. Previous products developed for the Shedd include protective booties for penguin feet, a decompression machine designed with sea horses in mind, and a fish anesthesia system for medical examinations.